THE TARZAN TWINS, 1927, was reprinted by the Volland Co. at least 7 times but the original is designated FIRST EDITION on the fly leaf. I have both a first and seventh edition in my possession. The second TARZAN TWIN BOOK " Tarzan and the Tarzan Twins with Jad-Bal-Ja the Golden Lion" was publish--ed by Whitman Publishing Co., Racine, Wisc. It is a paper-bound big-big book, number 4056. 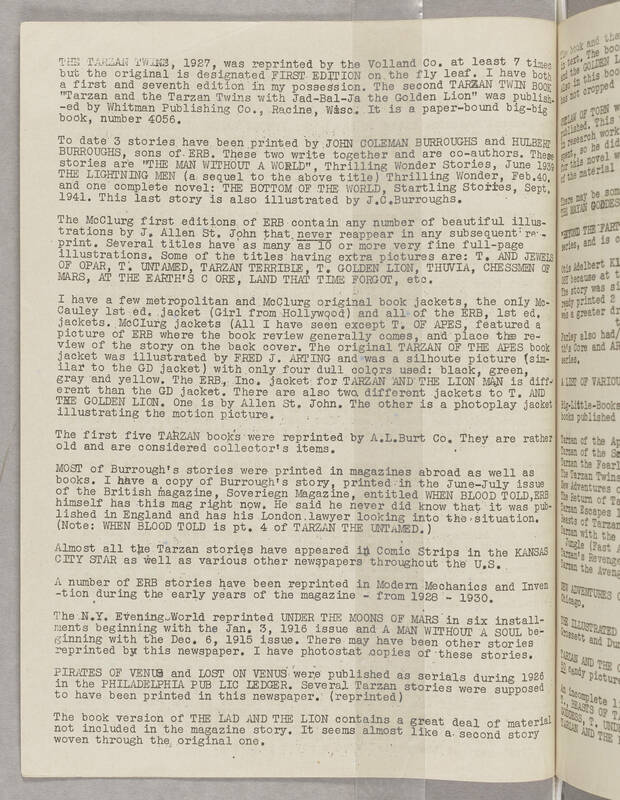 To date 3 stories have been printed by JOHN COLEMAN BURROUGHS and HULBERT BURROUGHS, sons of ERB. These two write together and are co-authors. These stories are "THE MAN WITHOUT A WORLD", Thrilling Wonder Stories, June 1939 THE LIGHTNING MAN ( a sequel to the above title) Thrilling Wonder, Feb. 40. and one complete novel: THE BOTTOM OF THE WORLD, Startling Stories, Sept. 1941. This last story is also illustrated by J.C. Burroughs. The McClurg first editions of ERB contain any number of beautiful illus-trations by J. Allen St. John that never reappear in any subsequent re-print. Several titles have as many as 10 or more very fine full-page illustrations. Some of the titles having extra pictures are: T. AND JEWELS OF OPAR, T. UNTAMED, TARZAN TERRIBLE, T. GOLDEN LION, THUVIA, CHESSMAN OF MARS, AT THE EARTH'S C ORE, LAND THAT TIME FORGOT, etc. I have a few metropolitan and McClurg original book jackets, the only Mc-Cauley 1st ed. jacket (Girl from Hollywood) and all of the ERB, 1st ed. jackets. McClurg jackets (ALL I have seen except T. OF APES, featured a picture of ERB where the book review generally comes, and place the re-view of the story on the back cover. The original TARZAN OF THE APES book jacket was illustrated by FRED J. ARTING and was a silhoute picture (sim-ilar to the GD jacket) with only four dull colors used: black, green, gray, and yellow. The ERB, Inc. jacket for TARZAN AND THE LION MAN is diff-erent than the GD jacket. There are also two different jackets to T. AND THE GOLDEN LION. One is by Allen St. John. The other is a photoplay jacket illustrating the motion picture. The first five TARZAN books were reprinted by A.L.Burt Co. They are rather old and are considered collector's items. MOST of Burrough' s stories were printed in magazines abroad as well as books. I have a copy of Burrough's story, printed in the June-July issue of the British magazine, Soveriegn Magazine, entitled WHEN BLOOD TOLD, ERB himself has this mag right now. He said he never did know that it was published in England and has his London lawyer looking into the situations. (Note: WHEN BLOOD TOLD is pt. 4 of TARZAN THE UNTAMED.) Almost all the Tarzan stories have appeared in Comic Strips in the KANSAS CITY STAR as well as various other newspapers throughout the U.S. A number of ERB stories have been reprinted in Modern Mechanics and Inven-tion during the early years of the magazine - from 1928 - 1930. The N.Y. Evening_World reprinted UNDER THE MOONS OF MARS in six install-ments beginning with the Jan. 3, 1916 issue and A MAN WITHOUT A SOUL be-ginning with the Dec. 6, 1915 issue. There may have been other stories reprinted by this newspaper. I have photostat copies of these stories. PIRATES OF VENUS and LOST ON VENUS were published as serials during 1926 in PHILADELPHIA PUB LIC LEDGER. Several Tarzan stories were supposed to have been printed in this newspaper. (reprinted) The book version of THE LAD AND THE LION contains a great deal of material not included in the magazine story. It seems almost like a second story woven through the original one.